“When you say ‘Ural’, you mean factories” is a common saying in Russia. The history of the Ural Mountains region is inextricably connected to the industrial power of the country. In the 18th century the Demidovs, a family of mining entrepreneurs, founded a huge industrial empire in the Urals. Furthermore, during World War II hundreds of factories were evacuated to the area. Nowadays many Ural industrial enterprises that used to be off limits for visitors have become open for organized excursions. RBTH has selected six lively industrial tourism destinations in the Urals region. Nizhny Tagil (1,828 kilometers from Moscow) is one of the most important regional centers for iron, steel and the engineering industry. It hosts the Mining Ural Museum, a unique complex with 10 different museums. It is the first of its kind in Russia. The museum complex is made up of a mixture of very old buildings, plants and industrial facilities. The foundry and ironworks, which were established in 1725, but ceased working in 1987, cover three epochs: the age of steam, water and electricity. The Factory-Museum of the History of the Technique of the Iron and Steel Industry is an open air industrial monument spread out over 30 hectares that exhibits items belonging to the whole technological cycle of industry. A blast and an open-hearth furnace, a water turbine dating back to 1892 and an 18 th -century hydraulic system are among the many items on display that demonstrates the origins of industry. The Urals produced the world famous “Stary Sobol” (old sable) steel, as well as corrugated iron, which were used to supply England and America. Also of great interest is the Mednorudyansky deposit where a 260-ton boulder of malachite was extracted in 1835, which was later used in the construction of the Winter Palace in St. Petersburg. The museum complex also features a collection of tanks from the “Uralvagonzavod” (Ural Vehicle Factory) and a monument to the inventors of the steam locomotive, Yefim Cherepanov and his son Miron. The Beloyarsk Nuclear Power Station opened the age of large-scale nuclear power in the USSR beginning in 1964. Located in the Sverdlovsk Region on the banks of the Beloyarsk Reservoir (1,107 kilometers from Moscow), it’s the only nuclear power station in Russia to have various types of reactors in one area. The tour will demonstrate the station’s unique technology, its unit control board and the reactor and turbine halls of the BN-600 power block, the only one in the world with a fast-neutron reactor at an industrial level. In its own way the territory of the nuclear power station is a beautiful place. Foreign citizens must book visits 45 days in advance. The best-preserved monument of 19th-century industrial architecture in Europe can be found in Polevskoi, a big industrial center in southern Sverdlovsk Region (1,816 kilometers from Moscow). Its main exhibition shows a blast furnace with the original foundry equipment, a casting yard and a puddle welding plant. The museum is located at the Seversk pipe factory. Excursions must be booked in advance. In Sysert (1,980 kilometers from Moscow) ecologically clean porcelain is produced in accordance with the tradition of Ural folk art of the late 19th-early 20th centuries. The factory is famous for its ceramic iconostases for churches in Russia, Rome and Jerusalem, among other places. While here visit the factory, take a master-class in porcelain painting, and take a trip to the nearby dam and Sysert’s factory-fortress. The Yegorshinskaya State District Power Station in Artyomovsk (2,094 kilometers from Moscow) was built in 1913 and was in operation for 80 years. In retirement, it has gained a new lease on life as a museum of energy. Rare machines are on display and there is a great exhibit on the difficult conditions and everyday life of workers in the past. The “Height 239” Plant (1759 kilometers from Moscow) is Russia’s first innovative “white metallurgy” project, which is more environmentally friendly than its counterpart, “black metallurgy.” This unusual and modern plant produces special large-diameter pipes used in complex pipelines in permafrost regions, in seismically active areas and at the bottom of the ocean. It was the first plant in the world to produce branded color-striped pipes. 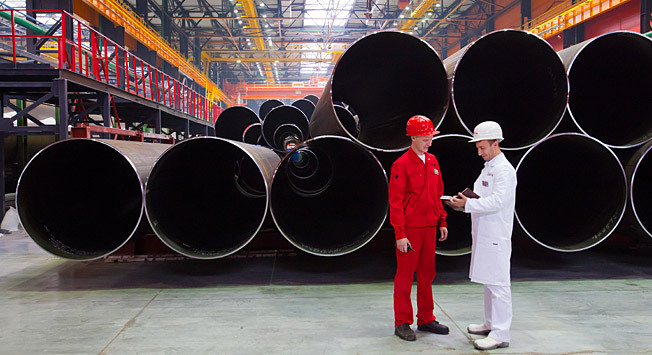 It is located in the Chelyabinsk laminated pipe factory and is higher than all other pipe factories in Russia at 239 meters above sea level, hence its name. Excursions must be booked in advance.